2011: Signed an extension with the Alouettes in June. 2008: Signed with the Alouettes in June. 2008: CFL Draft: RD 6 (48), Montreal Alouettes. A serious injury to his right knee in the 17th game of the 2015 season forced Brodeur-Jourdain to show some patience before getting the green light from the medical staff to return to game action in 2016. He missed the first six games and had limited playing time during the year so he could recover completely from the operation. 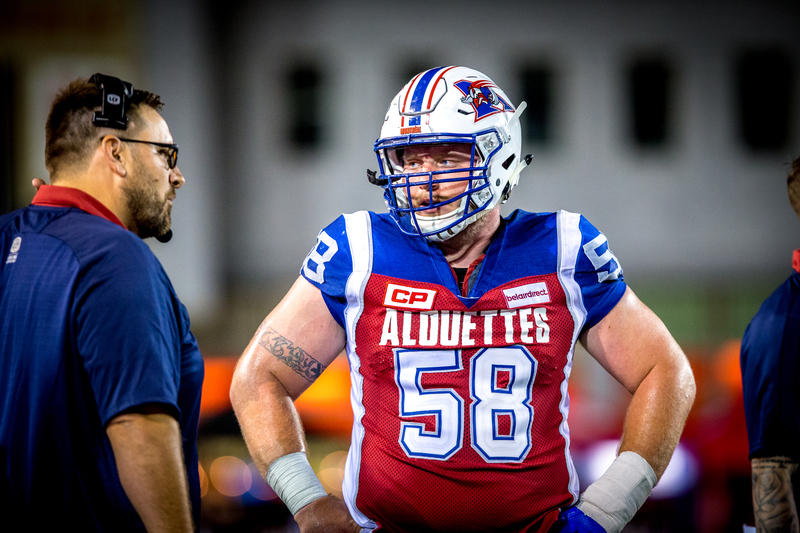 His courage and dedication to getting back to the field made him the Alouettes nominee for the Jake-Gaudaur Veteran’s trophy last season. Playing under center and snapping to seven different quarterbacks throughout the season, Brodeur-Jourdain helped a solid offensive line protect all of them more than adequately as the team only surrendered 33 sacks in the 17 games he played. Brodeur-Jourdain also helped the team gain 1,858 rushing yards, good for third place in the CFL. In the team’s seventeenth game of the year, the 7-season veteran tore his ACL and MCL. With the game and the season on the line, he showed his commitment to his team and his teammates as he returned to the field to complete the game. During the course of the 18 games this season, Luc Brodeur- Jourdain was a huge catalyst for the offensive line. The Quebecer has been a model of consistency throughout his career and 2014 was no exception, as he worked with four different quarterbacks. 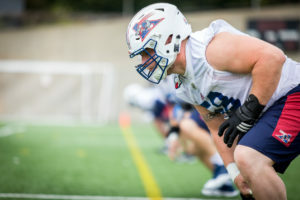 The offensive line also allowed Brandon Whitaker to lead the CFL in rushing yards before his injury, thanks to stellar blocking. He surpassed the 100-game mark in the Canadian Football League. 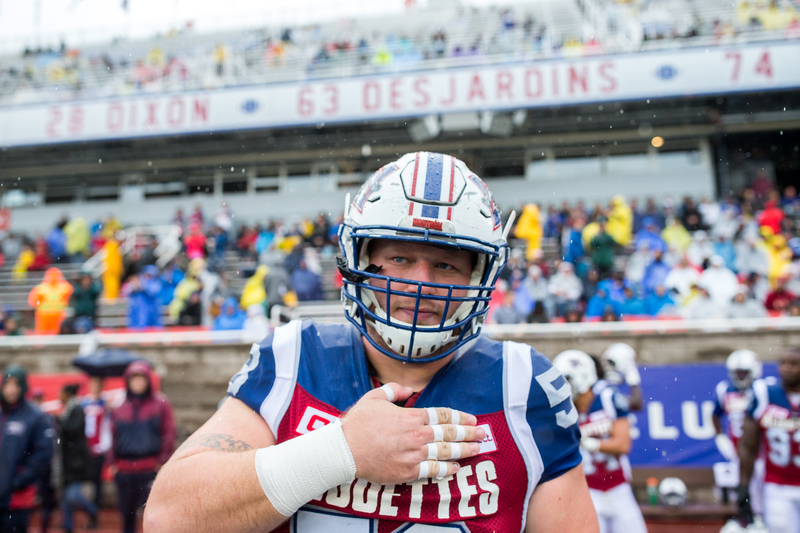 Brodeur-Jourdain, who played in all 18 of the Alouettes games this season, continues to anchor the offensive line that has allowed just 41 sacks- good for second fewest in the CFL all while the Alouettes offense has attempted 581 passes. 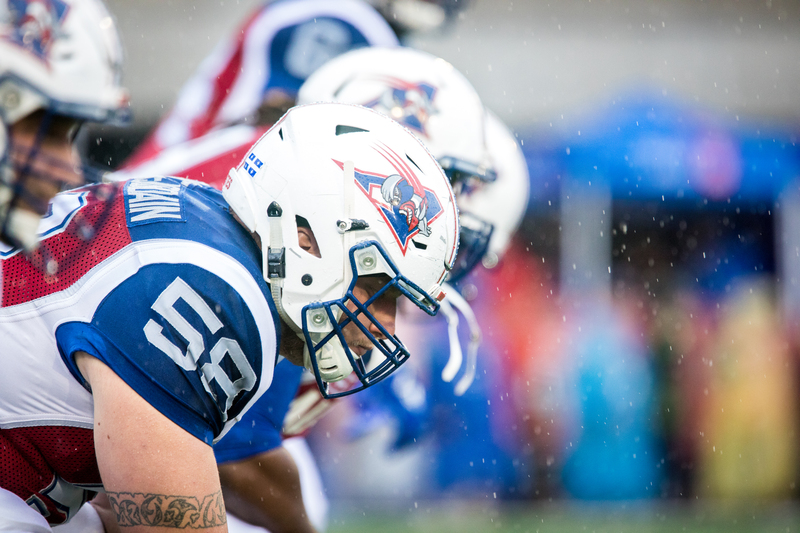 By adding the number of sacs allowed and holding penalties, the Alouettes total is a league-best 47 while the closest team’s total is 51. He is considered the quarterback of the offensive line and spends additional time every week with the coaches as he makes the calls for the offensive line. The center between guards Michael Ola and Ryan Bomben, has snapped the ball to four different quarterbacks this season. 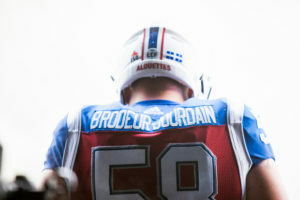 Often regarded as one of the smartest players in the league, Brodeur-Jourdain helped pave the way for running back Brandon Whitaker’s 162-yard performance on the ground on July 25 against Edmonton making key blocks to spring his tailback. Brodeur-Jourdain earned his first selection as a CFL All-Star.The St-Hyacinthe, QC, native helped his teammates on the offensive line give Anthony Calvillo plenty of time to locate open receivers en route to the Alouettes finishing the regular season second in the CFL in passing yards and touchdown passes. He played the entire season and the East Semi Final as the starting centre for the first time in his career. He played an integral role in helping the O-line create a clean pocket for Anthony Calvillo to locate his star receiver Jamel Richardson, who led the league in receiving yards. He is a three-time Vanier Cup champion, winning in 2004, 2006 and 2008. He was named to the CIS first All-Star team in 2006 and 2007 and to the Quebec Conference All-Star team in 2006, 2007 and 2008. He is involved in various Alouettes’ community programs including Together at School with the Alouettes. 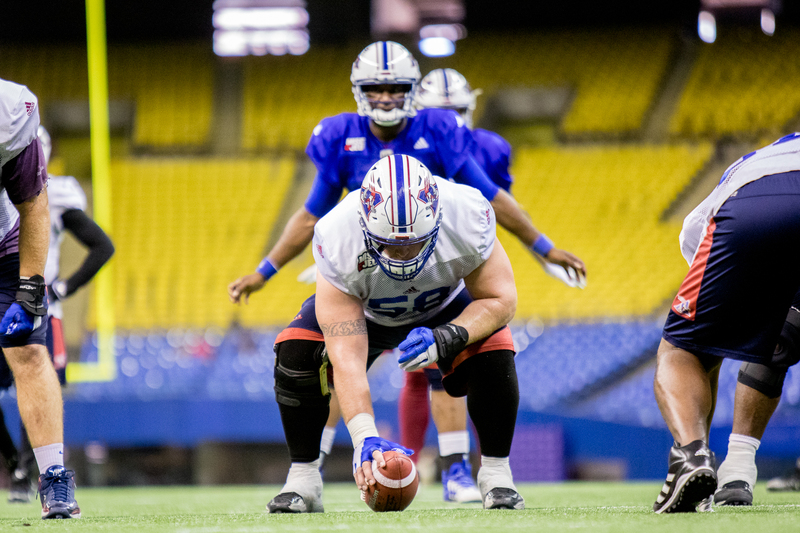 In 2010, he caught an 11-yard pass from Anthony Calvillo while starting at guard for the first five games of the regular season before transitioning to centre for the remaining five games. 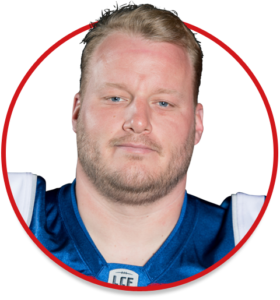 Brodeur-Jourdain also appeared in the team’s playoff contest and in the Grey Cup. He is a three-time Vanier Cup champion, hoisting the trophy in 2004, 2006 and 2008 with the Laval Rouge et Or. He played his Cégep AAA football with the Géants de Saint-Jean-sur-Richelieu.